This Sunday's Gospel reading is one that I would take to a desert island if I could. It is the story of the encounter on the Emmaus road. I remember it being taught passionately when I was doing my ordination training. The story is significant for in the encounter that these 2 have withe the Risen Christ, the scriptures are opened and they are interpretted by Christ and He demonstrates, He reveals how those scriptures point to Him. 23 For I received from the Lord what I also handed on to you, that the Lord Jesus on the night when he was betrayed took a loaf of bread, 24and when he had given thanks, he broke it and said, ‘This is my body that is for you. Do this in remembrance of me.’ 25In the same way he took the cup also, after supper, saying, ‘This cup is the new covenant in my blood. Do this, as often as you drink it, in remembrance of me.’ 26For as often as you eat this bread and drink the cup, you proclaim the Lord’s death until he comes. Now on that same day two of them were going to a village called Emmaus, about seven miles from Jerusalem, and talking with each other about all these things that had happened. While they were talking and discussing, Jesus himself came near and went with them, but their eyes were kept from recognizing him. And he said to them, ‘What are you discussing with each other while you walk along?’ They stood still, looking sad. Then one of them, whose name was Cleopas, answered him, ‘Are you the only stranger in Jerusalem who does not know the things that have taken place there in these days?’ He asked them, ‘What things?’ They replied, ‘The things about Jesus of Nazareth, who was a prophet mighty in deed and word before God and all the people, and how our chief priests and leaders handed him over to be condemned to death and crucified him. But we had hoped that he was the one to redeem Israel. Yes, and besides all this, it is now the third day since these things took place. Moreover, some women of our group astounded us. They were at the tomb early this morning, and when they did not find his body there, they came back and told us that they had indeed seen a vision of angels who said that he was alive. Some of those who were with us went to the tomb and found it just as the women had said; but they did not see him.’ Then he said to them, ‘Oh, how foolish you are, and how slow of heart to believe all that the prophets have declared! Was it not necessary that the Messiah should suffer these things and then enter into his glory?’ Then beginning with Moses and all the prophets, he interpreted to them the things about himself in all the scriptures. As they came near the village to which they were going, he walked ahead as if he were going on. But they urged him strongly, saying, ‘Stay with us, because it is almost evening and the day is now nearly over.’ So he went in to stay with them. When he was at the table with them, he took bread, blessed and broke it, and gave it to them. Then their eyes were opened, and they recognized him; and he vanished from their sight. They said to each other, ‘Were not our hearts burning within us while he was talking to us on the road, while he was opening the scriptures to us?’ That same hour they got up and returned to Jerusalem; and they found the eleven and their companions gathered together. They were saying, ‘The Lord has risen indeed, and he has appeared to Simon!’ Then they told what had happened on the road, and how he had been made known to them in the breaking of the bread. 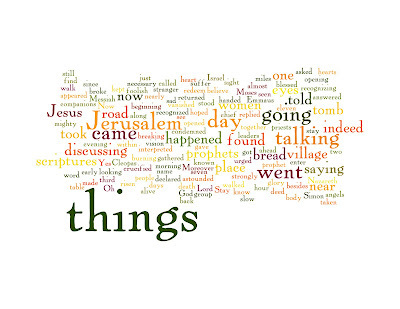 Having wordled the reading I am really struck by the way that the significant word that sticks out is 'things.' 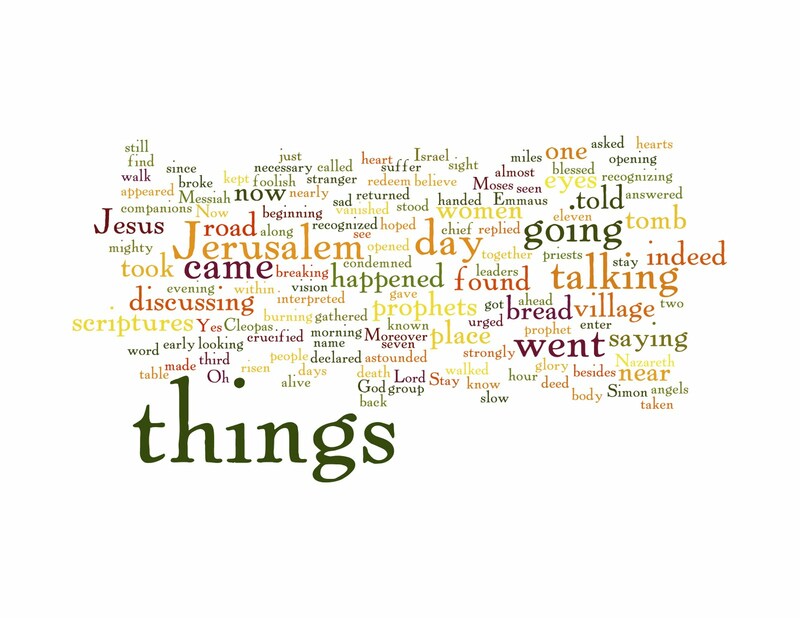 What things? 5. The passages of scripture, how the Bible itself as one long love story between God and humanity reaches it's climax in this man Jesus. And these things are revealed in the normal stuff of life - in grief and tragedy, on a walk, in conversation, in a meal, and between friends and strangers.